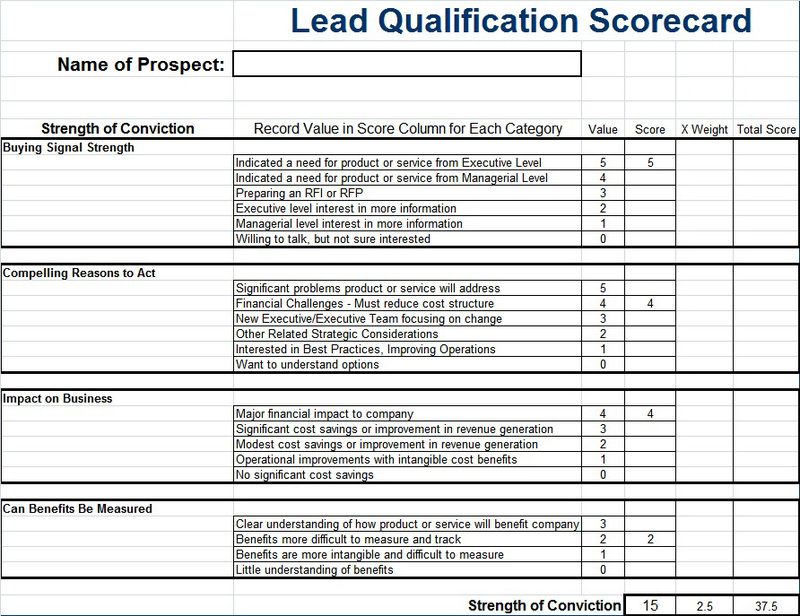 The Lead Qualification Scorecard is used by the sales rep to rate their lead as to the probability of closing the sale. Instead of blindly calling on every prospect, the qualification process screens those “opportunities” based on criteria established from past successful sales. The criteria may include customer need, defined timetable for a decision, budget, competition, contact level, etc. By selecting a numeric value for each of the scorecard’s criteria, the Excel spreadsheet calculates a total score. The score is used to determine whether the lead should be advanced to the qualified prospect level or simply dropped. The key is formalizing the scorecard process in the organization so that sales rep has a tool based on buying criteria that has proven to be a good indicator of past buying activity. Advancing a lead to the qualified prospect status means that the sales rep should have the total commitment of sales management and to all available resources of the company in closing the sale. ACG developed this tool for a specific client but has generalized it for this write-up.